File Under: Why Cinque Terre deserves more than a day trip. Don't miss the See and Stay Guide to Cinque Terre! I remember exactly where I was when I first learned about the Cinque Terre and saw photos of the five seaside towns located on the Italian Riviera. It was oddly enough in a French language class in high school while discussing the French Riviera, which led to the Italian Riveria….and photos of these five majestic towns. It was also the moment I realized love at first sight was a real thing. And the moment I decided that someday, I had to explore this part of the world. It took about 15 years, but finally, this past May, I made it to the Cinque Terre. I had the same debate as most others do when planning an Italian adventure – Cinque Terre or Amalfi Coast? The best advice I was given was you can’t go wrong with either. And while Amalfi Coast is definitely at the top of my list for next time, Cinque Terre was everything that 17-year old me had hoped and dreamed it would be. We opted to end our 10-day Italian adventure (also included Rome, Florence, a day trip to Tuscany, and a pit stop in Pisa) relaxing in the Cinque Terre which was a fantastic way to end the trip --- but also made it that much harder to get on the plane home. I could’ve stayed in our apartment in Manarola forever. Cinque Terre is advertised as a popular day trip destination whether staying in Florence, Lucca, or elsewhere on the Italian Riviera. And while I’m usually a big fan of day trips as a way to maximize your time, not all towns are created equal. The “5 lands” are truly as magical as they’re hyped up to be. They’re also as busy and crowded as they’re hyped up to be. The real magic of the gorgeous waterfront hill villages happens in the early morning and later evening when all the day-trippers have left. So, what’s so magical about Cinque Terre? I’ll let these pictures speak for themselves…..
A stop in the Cinque Terre could easily be shortened to 1-2 nights as much as it could be lengthened to 5-7 nights. I spent 2 nights in Cinque Terre, but maximized train schedules to arrive early enough the first day; I essentially had 2 full days and 2 nights. I could’ve easily spent another 2 days to delve deeper into the five villages, more time on a boat, and see more of the Riviera Coast. But, if you’re crunched for time, 2 days is plenty to explore the 5 towns and spend the third venturing out along the Italian Riviera. First things first….I’m a realist. What the heck are these 5 lands? The Cinque Terre is made up of 5 seaside villages. It’s also often referred to as 5terre. From East to West, you’ve got Riomaggiore, Manarola, Corniglia, Vernazza, and Monterosso. Each has its own charm. If you’re completely lost about the 5 villages and where to stay – keep reading here! Arrival. Arrive by 9 am to maximize day one. See transportation guide. Check into Airbnb/VRBO. Hit the trailheads. Head to Monterosso via train to start the hike. Walk along the coast from Monterosso al Mare through the tunnel to old town and follow signs for the hike. The hike to Vernazza takes about 2 hours give or take depending on heat, crowds, and your fitness level. Once you get to Vernazza go down through the village and cool off with some lunch al fresco at one of the restaurants right along the water. Also, you’ve definitely earned a glass of vino. Explore the towns. 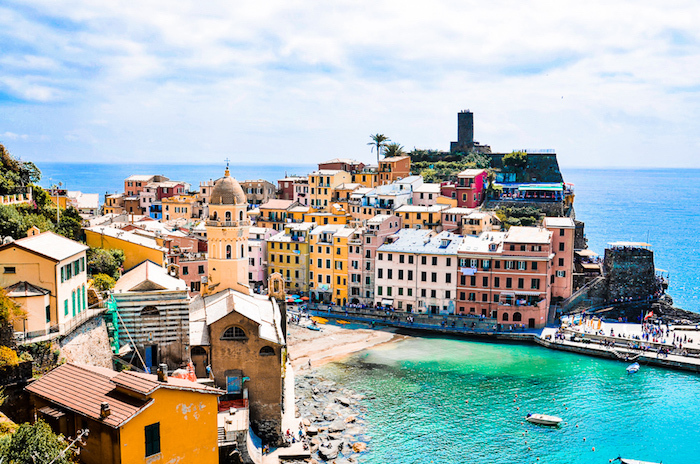 Soak up the sun, hang out by the water, explore the shops, and eat some gelato in Vernazza. Then either continue on the hike to Corniglia….or hop on the train. In Corniglia you can’t miss trying the local white wine – Vin Sante. You’ll see tons of vineyards on the hike to Vernazza and all over the hillsides of Corniglia. Chill waterside: Take as long or as short as you want exploring the towns before heading back to get ready for dinner. If you wind up with extra time, go back and hit the beach in Monterosso, or lay out along the water in one of the other villages. Dinner with a view: Get a reservation at Billy’s da Trattoria in Manarola (just minutes away from the Airbnb we stayed at), especially on the patio at sunset. The views are to di(n)e for. Alternative options: arrive the night before if you’re coming from anywhere other than Florence, Pisa, or Genoa to have a full day. If it’s hot you’ll want to save the hike for day 2 to get an early start. It gets hot on the trail! In that case, Explore the towns on day 1, then spend day 2 hitting the trails and closing off on the water. Rise and Shine: If you booked the same accommodations, start your morning with some coffee on the gorgeous veranda. No better way to start the day and realize how lucky you are to be in one of the most beautiful places in the world! Hit the towns – again: If you followed our day one suggestions, you only really saw 3 of the 5 villages. Hop the ferry or train to explore the other two (i.e. Manarola, Riomaggiore). Rent a boat: Head to Riomaggiore boat dock and hire a boat and captain for the day. Those views of the 5 villages and dramatic hillsides are unbeatable from the water. Aperitivo: I know, I know. 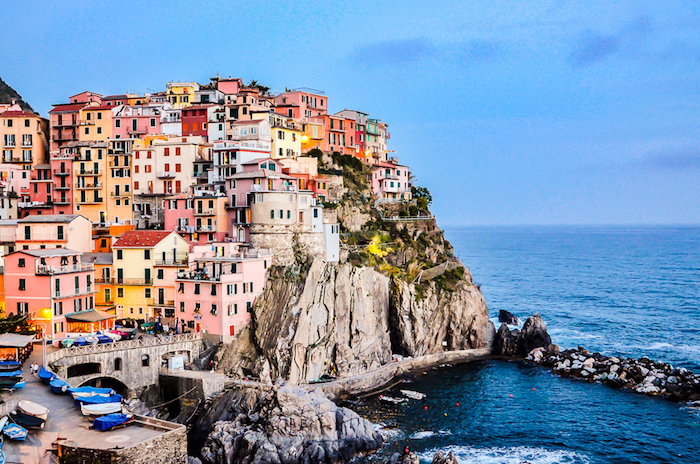 We’re partial to Manarola. But, you can’t hit the Cinque Terre without a visit to Nessun Dorma – a bar with the best views in the Riviera. The cocktail or rosé menu are the best, and don’t miss a cheese plate or bruschetta. Mmmmm. We enjoyed it here at sunset. Dinner and drinks: Venture to another town, or find a solid local restaurant for dinner in your village. If staying in Riomaggiore or Vernazza, hit the local watering hole. Free Day! By now you’ve explored all 5 towns, you’ve hit the trailheads, and you’ve spent time out on the water. You can delve deeper into any of those areas (there are some serious hiking trails in the park) – or…take a day to go explore the rest of the Riviera. I Found My Love…. in Portofino. Buy a train ticket to Rapallo and head toward the water. Buy a roundtrip ferry ticket that will take you to Santa Margherita Ligure, Portofino, and San Fruttoso. We booked a roundtrip ticket so we could go to Portofino first, then got off in Santa Margherita Ligure to explore and catch a train home from there. 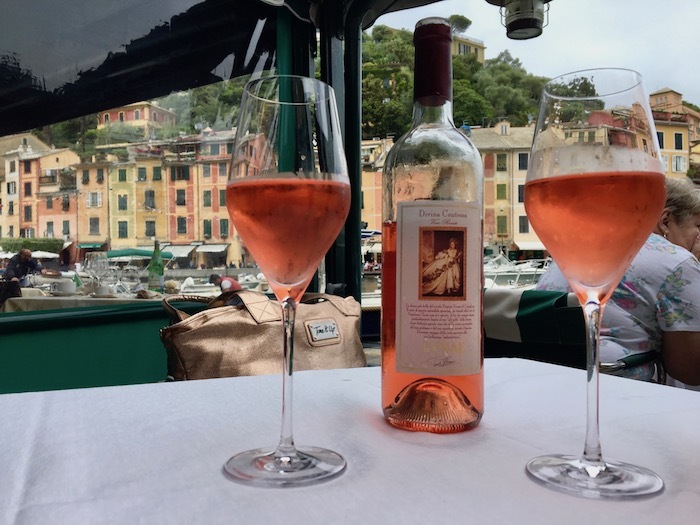 Oh, and when in Portofino, definitely sit and get a bottle of wine or bubbly and people watch the yacht parties and the lamborghinis driving down the tiny main road. Note – if weather and wave conditions are not friendly, the ferry service to San Fruttoso won’t run. Head east instead to Porto Venere. Not as well-known as the rest of the towns, a total hidden (for now) gem that fits right in with its sister 5terre and has a few more sights to explore. Another gem in the area is Camogli. If you’re in the area the second weekend of May, don’t miss their annual Fish Fry festival. The main festivities run on the Sunday with a giant frying pan on the beach serving up some fresh fish. Events start the night before with giant bonfires on the beach and fireworks.